Foodie Fridays: Rhubarb time of year again! Remember last year how wonderful our rhubarb was growing? This year the rhubarb is coming in strong and delicious. We’ve even made a $16 profit selling it to the local fruit/veggie stand (I love those guys). Rhubarb is a resilient plant that grows without any help therefore it’s a gardener’s dream, unless you don’t want it then I guess it would be a nightmare plant. 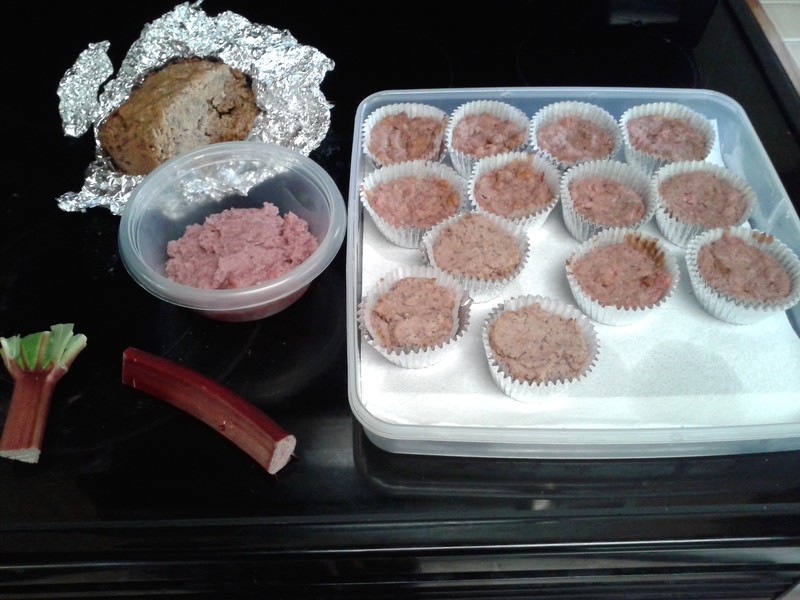 This year I’ve gotten into making cake breads with the rhubarb and even muffins! I’ve got the fancy muffins. The recipe I used was based loosely on the recipe for bread cake (upper left corner) from my Zojirushi bread maker. The mash in the tupperware is my attempt at ‘frosting’ where I combined the leftover mashed strawberries/rhubarb with powdered sugar and some coconut flour for thickening.